Sick kids opened the door for an early childhood appropriate lesson focused on the anatomy of the body. We’ve had a rough September. After a glorious and beautiful summer with dad home, September started, he went back to work and I got sick. Like really sick. It was so bad in fact, that he went back to work for a day, then had to take two days off, and it still wasn’t enough for me to get my footings. As I started to finally feel a bit better this weekend, Nathaniel and Samuel were both hit by what I’m hoping is not the same bug. The poor boys have not been feeling well at all. Then last night, it was Sophia’s turn to get hit. So today was not fun. Not only were the sick, but we were grumpy too. We spent a lot of time in front of the TV and on electronics (which obviously contributed to their grumpiness), just to keep them quiet and let them rest (they like to be on the move even when they’re sick). I had been planning on doing some activities around the body and how it works and felt that after my bought with a nasty cold and their current battle with one, that it would be a good day to go over some basics. So I pulled out our copy of Usborne Books’ See Inside Your Body, and we got to learning! This is seriously such an amazing book! It’s broken down into easy to read to pages, each one focused on a different part of the body or function. There is so much information and the illustrations are beautiful. The kids loved flipping the flaps to see under the different body parts. Since there is so much information and the kids are still pretty young, I didn’t read the book verbatim. Instead, I focused on the main functions and processes and then summarized the information based on what was written on the pages. I found this was a much easier way for them to process the information and retain some of it. Since the kids are all sick, I spent a little extra time on the page about circulating blood and the one on digestion. there wasn’t too much information about white blood cells, but I used what was there as a springboard to discuss how their body is making more white blood cells to fight the infection in their body and help them get better.We make a point of discussing the importance of good nutrition regularly with our kids. We talk about the benefits of healthy food and good nutrition, focusing on making our bodies stronger, healthier and helping us grow. We also make a point of focusing on good nutrition when sick and the impact it has on healing. The digestion page was a fantastic springboard for this discussion as I showed them the route food takes through the body, how it is filtered and then excreted. 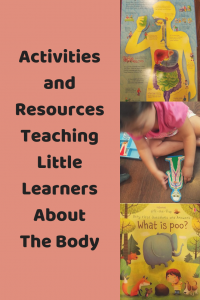 One of the kids’ favourite books is Usborne’s What is Poo?, and this was a great followup to the digestion discussion (they seriously never tire of it). This book focuses more on the actual poop and not the digestion and has some great fun facts, like the fact that rabbits eat their poop! I honestly had no idea until I read that book! After we finished with the books, I pulled out this awesome Melissa and Doug Anatomy Play Set and as the kids built the anatomically correct people, we reviewed the different body parts and their functions. It was really neat to lay the puzzle down and layer the different elements, just so they could see how much is really inside. After we finished discussing the ways the body work and the functions of different parts, I put on the good old Magic School Bus and we watched Season 3, Episode #9 “Works Out”. Since the kids were really interested in circulation and how muscles work, it was a perfect episode! As for tomorrow, we will still be sick and trying to stay quiet. Depending on how the kids are doing, my plan is to focus on germs, with Usborne’s What are Germs? and The Magic School Bus Season 1 Episode 3 “Inside Ralphie”.